Penang Buddhists Free School Ex-pupils' Association was formed in 1984. The founder members were all students from Penang Buddhist Free School and their motive of the formation of the said Association is an act of reciprocating action from them towards the Society and the public in appreciation of the contribution and support given to the mother School. Since its formation, the Association had organized many functions, activities and gatherings for her members and the public to groom the seeds of love and thoughtfulness. It is hoped that with the spread of the love and thoughtfulness, the caring society would be created for the benefits and welfare of all human beings irrespective of races, cultures, and religions. With high degree of team-spirits in the Management Committee, Penang Buddhists Free School Ex-pupils' Association had achieved remarked results and its contribution and service were well recognized and valued among the Penangites. The Management Committee was and is able to achieve some remarkable results because the Committee is committed to realize and fulfil its Mission towards its members and the public. The Mission is enhancement of Culture, promotion of the teaching of Buddha, improvement of the Standard of Education, and Involvement in social and charitable activities. These missions are geared to eradicate the poverty and grooming the sense of responsibilities of individual to the Society at large. 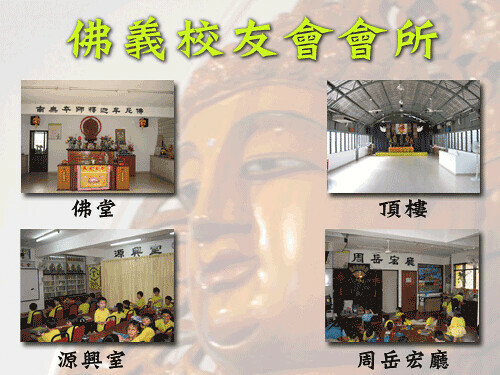 In 1997, Penang Buddhists Free School Ex-pupils' Association finally bought its own Club-house and in conjunction with this auspicious day of Opening Ceremony of the Club-house, the Management Committee embarked another Big Project for those poor and needy people. The project was the establishment of Dialysis Centre for those lower-income group. The Dialysis Centre was declared open for the use of Public on the same day together with the opening ceremony of the Club-house. This was a earmarked history in the Penang Buddhists Free School Ex-pupils' Association. The dialysis centre is nonprofit making unit for those poor kidney patients. The charge per dialysis treatment is RM50-00 as compare to about market rate of RM150-00 per treatment. However, its charge was further reduced to RM30-00 per treatment with effective from 1st November, 2002. Penang Buddhists Free School Ex-pupils' Association is able to come a long way in spite of many hindrance and obstacles since its formation is solely due to the support and concern from her members and the public. Members and the public not only gave support and encouragement either morally or financially, they also took part actively in the activities organized by the Association. The goal towards perfection is still far, the Missions are yet to get a strong grip to face challenges, We sincerely hope that Public can still continue to give us moral and financial support to enable us to carry many activities for the benefits and welfare of those who need concern and love. Without your support, we would not survive till to date. We appreciate your presence and participation and thank you for your concern.